The following is by no means a list of the best hotels in Belgium. I am aware of many fantastic Hotels and Bed & Breakfasts around Belgium. Some are reasonable; some are expensive to downright ludicrous. What I am trying to list are places I have stayed at that make me feel extremely comfortable after a long day on the road or in the pubs. I have listed them according to personal feelings and memory status. I do not cover many areas such as Ghent, Liege and others. Ghent is a wonderful town and a must see on any trip to Belgium, but I have not had the opportunity to spend the night there during any of my trips to Belgium. If you are planning a trip and have a basic itinerary, I can offer suggestions for most areas of the country. I have spent time in almost all major cities, except Liege and have traveled through and spent time in many of the smaller towns. Also, Belgium has numerous castles that offer overnight stays, something I would love to do on one of my trips. More recently some new smaller Bed & Breakfasts with attached nano breweries have been developed. This is by far my favorite place to stay in Belgium. It is what they call a ‘vacation home’ or Vakantiehoeve in Belgium. It is owned by Phil Driessens and Daisy Coutteau, sister of Urbain Coutteau, owner of Struise Brewers. De N oordhoek is a charming house about 3 miles from the small town of Lo Reninge. The house has 5 bedrooms and can sleep up to 25 people, or the rooms can be rented individually. Daisy will stock the kitchen if required or you can shop in the nearby town. The ‘farm’ is an active ostrich farm and their ’family’ resides quietly out back. The house is VERY quiet, but things can get pretty noisy in the evening if with the right group of people. This is a wonderful place to stay and very relaxing. Some ‘Top 10’ placements require quite a bit of thought before making a decision, but this was an easy choice. At least it was ba ck when Bernadette and Guy Claus were the owners and they had the concept of ‘Bed & Breakfast’ down to a science. But they sold the brewery and B&B and the new owners have made some changes. I have not been back since Bernadette left, so any new info that might be forwarded to me would be great. If I hear anything other than wonderful comments, then this will be removed from the listing. Hotel Ca rolus is actually part of the Het Anker Brouwerij in Mechelen. So, not only will you be staying in a comfortable room in a brewery, you don’t have to walk far for a beer; and a fresh beer at that. The rooms are basic, but you will find that you don’t spend much time in the room anyway. The Het Anker Brouwerij is said to be the oldest operating brewery in Belgium, established in 1369. The current building dates to 1422. The brewery is open every day but Wednesday so plan accordingly. There is also a great little restaurant and a beer shop here. Owners Thierry and Katrien welcome you to their home, which is also a hotel. Hotel Prinsenhof is the epitome of what every hotel should be like. This is a first class hotel and everything you encounter during your stay is meant to bring memories and pleasure. This is a larger B&B with 16 rooms but you will always feel like part of the family. It is just a few blocks off the Markt on a very quiet side street. There are dozens of great hotels and Bed & Breakfast inns in Brugge, but I really like this Crowne Plaza. It is on the Burg and if you have a front facing room, your view will be of the ancient town square and the famous Basilica of the Holy Blood. While the Burg is not as famous or as exciting as the Markt a block away, it is very quiet in the evening. The hot el is built on the foundation of the 10th Century St. Donaas Cathedral and some of the original foundation walls are preserved in the cellar. The hotel also has 2 options for eating. The Linde is a great place for a quick breakfast or lunch and The Kapittel is a serious restaurant with great foods. Sometimes they will offer selections prepared with regional beers. There is also a nice bar with a piano player. The hotel offers underground parking and the staff is very attentive and helpful in arranging day trips or giving directions. I have stayed at numerous hotels in Brussels and all are excellent in their own ways, but Hotel Metropole is an experience. Recently designated as a National monument and conveniently located one block from the Bourse and 4 blocks from the Grand Place, this is a must do for the traveler to Brussels. Built i n 1895 Metropole was built as a Grand Hotel and it remains one to this day. Extreme elegance bordering on downright opulence, this hotel is a memory in itself. Please be persistent when trying to book a room here. Normal rates start at 495 Euro for the basic room (which will be larger than 2 regular rooms elsewhere) but I have never paid more than 100 Euro to stay here. Great Place, Great Location, Great Memories. Hotel Rubens is in a great location of Antwerp. 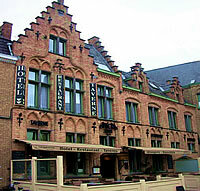 The hotel offers 36 rooms and is less than a minute walk to the Grand Place. All the rooms are very spacious and all amenities are included. Each room has a different décor and each is very homey. The breakfast buffet is included and offers hot and cold specialties. Service is impeccable and each person is treated like royalty. There are hundreds of hotels in Antwerp and many have their own unique charm, but this one has never failed. Located in a 130-year-old building and a mere 300 meters from the Grand Place, The Marriott Brussels is a great place to stay for the visitor to Brussels. Directly across the street from the Bourse and one of the main Metro rail stations, one can travel quickly to any area of Brussels with minimal hassle. If you are drivin g, there is an underground parking garage and a short 3-minute drive will put you on the ring road around central Brussels. The Marriott offers plush accommodations for a very reasonable tariff. The rooms are a bit on the small side, but the bathrooms make up for it with most featuring separate tub and shower. Mini-bar and 5 star amenities complete the package. Most of the Brussels ‘Top 10 Restaurants’ that I list are about a 5-7 minute walk from here. The Marriott also features its own International restaurant; Brasserie le Sauvoir whose name was chosen to reflect the ancient times of Brussels and its rich history. Surrounded by the river “la Senne”, the Duke of Brabant was keeping his fish in his ponds (sauvoirs) and creating his own recipes for himself and his staff at this very spot in the early 12th century. During the construction of the hotel these ponds were discovered and carefully preserved by the city’s archeologists. The Marriott also features its own pub where one can enjoy a cocktail, glass of wine or a great beer. Lunch and dinner are also served in the bar. Very few of my readers will visit Marraine Zulma’s B&B. Those that do will be well rewarded. The house is an early 1900’s manor house that has been carefully restored and there is an additional guesthouse for the larger group or family. It has a large yard and gardens and a small pond and Mle. Zulma will be pleased to provide you with directions to the sights in the area or a bicycle map. There are only 3 guest rooms available but all are very roomy and each has it’s own bath. This is a gastronomic B&B so the breakfast is not a typical meat and cheese deal. You will receive a great full breakfast and if you choose the gastronomical evening meal, you will not be sorry. The usual evening meal consists of a 3 or 5 course event of fantastic regional cuisine. Some dishes are prepared with beer and almost every meal utilizes provisions form the local area. Any visitor to the region should consider a stay here. It is convenient to Rochefort, Tellin, the Grottos and only a short drive from Dinant. There is no tourism here. This is where you go to REALLY relax. 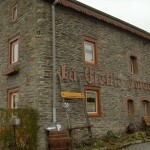 It is also the best place to stay if attending the yearly Sohier Beer Fest mentioned on my ‘Top 10 Festival’ page. Since I love this area of Belgium, it is only right that I include another place to stay, in the event that De Noordhoek is full up or closed due to the season. This is a great family run hotel that I have stayed at several times. It is run by a husband, wife and daughter who take extreme pride in their hotel, restaurant and bar. The restaurant is one of the top 5 in the area and the hotel offers rooms for most any traveler. While it is only rated 3 stars, it offers 4 star treatment. It is located right on the Markt, so is central to everything on the area including 5 minutes from In De Vrede and 10 to Struise Brewers.